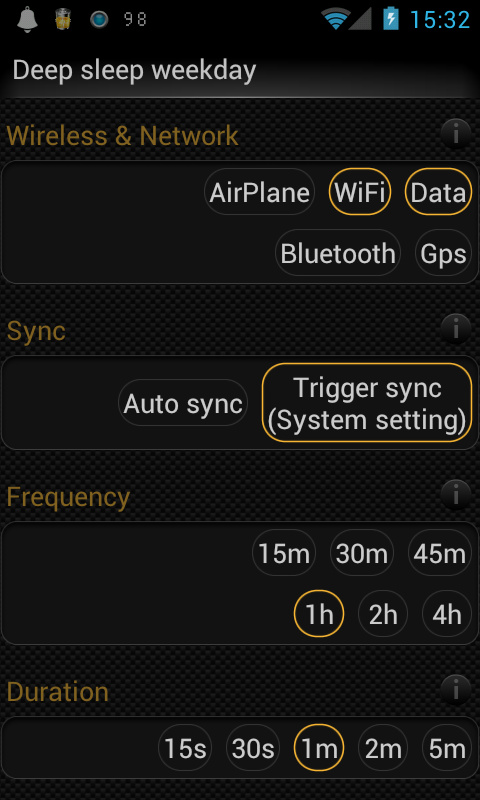 In advanced mode, you can customize more parameters, including day/night settings, active period, screen timeout, sync strategy, ignored apps, etc,. By constantly put device into deepsleep mode, we will save battery life due to no Internet connection, and therefore most of network-based apps, such as Facebook, Gmail will not work. Caution: during deepsleep mode on, this app may disrupt your normal activities, such as your email notification comes with larger delay. Screen off delay: a short delay before deepsleep start. 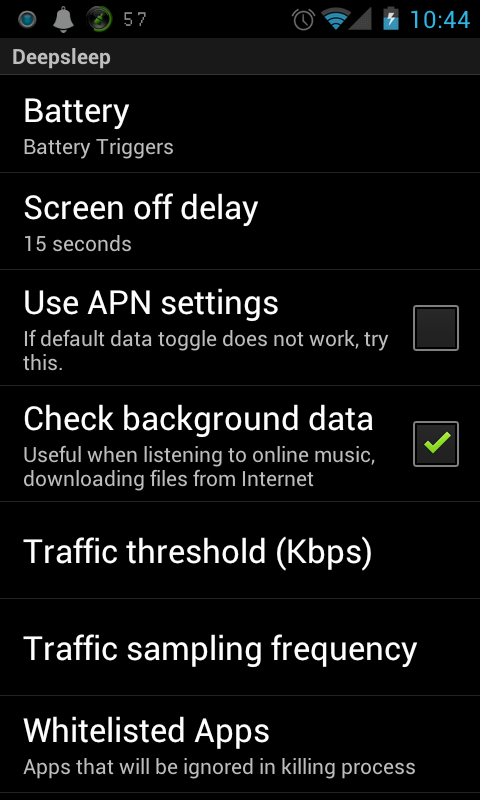 This option is used to avoid quick screen toggle. By default, the app come with pre-configuration that can work well on most devices. Just toggle a enable/disable button to start/stop it. "Custom" profile allows you to customize all parameters in order to fix with your special requirements. What is the difference between the paid & free versions? One thing which may be helpful, add some kind of integration with NFC Task Launcher or something similar for enabling/disabling and maybe even choosing current profiles by NFC tags. @Przemysław Rumik: That's a great idea. We added it into our request feature list. Thanks. The apps seems to be promising. But I still couldn't confirm that things are working as expected. 1. In custom profile, I set to close apps automatically. But no logs have been observed. 2. I pinged continuously to IP to ensure that it sleeps/wakes up at the set intervals. But the connection was either active all the time or never woke up after set interval. 3. I cannot set Airplane mode in the night. Also I have no idea what will happen when night mode is enabled(no documentation found). The best battery saver application I have found. Effective and simple on my Galaxy S3. One ehhancement request - could you please add a setting option to allow the Deep Sleep application to be automatically run when Android is started (many applications such as AVAST, Best Wifi etc have this). Including this option would mean that people (like me) who love the application could have it just run automatically rather than remembering to re start it after each boot. @Geoff Costello Yes, the app already supports "auto-start" once the Android OS is rebooted. Sorry about that. I had been updating ROMs and Kernals the last few days so I hadn't picked up that with a clean boot same kernel etc it starts automatically once you have run it once. "Once you have installed Deep Sleep Battery Saver run it once and chosen your profile saving it will start automatically each time you restart Android. You may need to rerun it once after installing a new or upgraded ROM. 1. I put an internet radio app (which needs data connection) into "DS whitelist" and was supposed to let it run even screen off. But finally I found that I have to put the app into both "stop apps whitelist" & "DS whitelist". What is the difference between the 2 whitelist? 2. I entered "0" into "Ignore recent apps". Is it appropriated? what is it actually? 1. Stop app whitelist are apps that will NOT be killed when screen off. Whereas DS whitelist are apps that if they are running, then the deep sleep mode does not turn on. Would love if this app had the option to update your Google Latitude location when it wakes up. Thanks Bao. But still not fully understand. 1. that means just putting the app to "DS whitelist" and the app should be running without cutting data connection after screen off. But it is not the case. I have to put it to both whitelist (not either one) to keep it running. Is there a bug? 2. 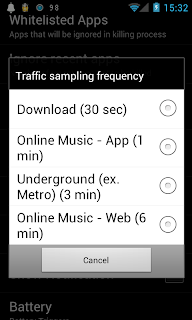 "number of recent app not to be killed" counts or not count the amount of app in "stop app whitelist" ? I used DS Battery Saver on both my tablet and phone (both running Jelly Bean - 4.2 on the phone and 4.1 on the tablet) and both experienced a similar problem. After the program had been in use for a while (can't be sure exactly how long - a few hours maybe? ), it becomes impossible to connect to the Internet, either through WiFi or mobile data. The device must be restarted to regain connectivity. I've noticed a few other people reporting this on the Play store too. I would love to see a fix for this, because the battery savings were tremendous while I was using it. Could you tell me what is your device model? Thank you. The tablet is an Acer A500 running Cyanogen Mod. The phone is a stock Nexus 4. Hi, I was using the DS on an Xperia S, worked fine, but after some hours the phone was awake all the time and drained the battery fast. After removing the application and restarting the phone the awake problem gone. Do U have some advice what can be the problem? @Anup Mannali Does that happen in free version or pre-defined profile? Hello v1.7 data doesn't wake up on my S2 on JB : i must uninstall DSBS and restart S2. Hi, I really like this app, and it's worked great! However, I just downloaded the new release, and now I have to turn on mobile data manually every time I turn the phone on. Is there a setting I'm missing, or if not, is it possible to go back to the prior version? Please help- I need this to work again! Hi. The on/off toggle home screen widget is great. I would have more use of another widget, which could switch between predefined profiles. The thing is, I would like for my phone to be on 'slumberer' when I sleep, yet my bed time is quite irregular. Is it possible to set a custom alarm for Full/Low battery alerts? 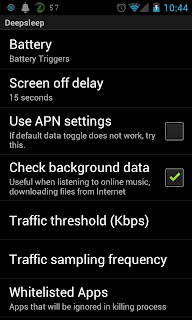 When on mobile data (2G or 3G), sync seems not to be triggered. On wifi, messages from gmail are detected, but on 2G/3G they are not - even after 3 wake cycles. Tested with following settings: frequency 5/10min, duration 1/2min). After I unlock the screen, messages are fetched almost immediatelly. Thanks for the response Bao Le Duc. Sorry for sounding ignorant (I am reasonably skilled with technology), but what does it mean when it says "1. auto-sync is a flag"? 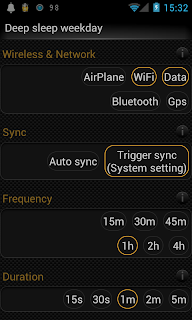 Is auto sync or trigger sync saving more battery? @Geoff: Please send us your log (Settings > General > Show logs > Tap on send button) that will help us to identify the issue. First of all thank´s for the awesome app. I´m using your proversion on Xperia acro S with FX209 and Nova Kernel. The app works fine, but sometimes it will not reactivate data or wifi when screen is back on. Or wifi is on and suddenly after 3 min. it´s off. What may be reason? tried today, it did cut off the wifi, but after I turn on the screen, the connection is not back, must turn on wifi manually? @hao li: there is an option that may help: Settings > Deep Sleep > User Present. Could you try to turn it off to see if the problem persists? sorry, just uninstalled. will try later. i use galaxy s3 and, i set custom profile. then, when the system in deep sleep, i can receive push alarm in kakaotalk isn't it? but, during DS, many apps send push alram to me. what is the reason? if i want to receive just kakaotalk alarm, i have to set stopping apps during DS? 1. Can not control GPS (log say so). 2. Unchecked Auto sync (and check Trigger sync, wifi off, 3G on) but it remains working in DS mode. I sent some testing Emails they all reached immediately no matter how I set the sync frequency. So how does the Frequency really work? Do it control both the data and auto sync on/off, or only control the data on/off ? Because I should remain data always on to receive Viber calls, I can't simply control sync upon data on/off. 3. Even stop running Apps forcing them into deep sleep, it also has a chance bring them awake. I did some tests on some IM Apps, when DSBS off, App notify the new message immediately. When DSBS on, it seems work for a while, but after a couple of minutes, notification rings all the same. Is it because DSBS try to kill them, but they have a method to revive their process? And another question: what's the difference between "App default" and "System settings" in Trigger sync? My Galaxy Note is rebooting randomly while app is active. I am using a stock firmware. Also when app is not active it is still in the status bar and using memory. You should change this behavior or make it an option. Also Wifi is not turned on after deep sleep. DSBS (pro) needs bug fixing! It is paid. I use Battery Saver DeepSleep but I have a problem. I have a software that makes the phone ring if it is moving. But DeepSleep Battery Saver prevents the accelerometer function in standby. I tried to exclude software in question in the white list, but the problem persists. What should I exclude for the sensor work? any way to unsubscribe from you? tried IE and firefox, cleared cache and cookies, all not working. What to do with my question?! While translating to Japanese, I have a question. Is it what you intended? I mean "Strong < Balance ?" It seems to me that it's in reverse order. Sorry if I don't have common English sense. I bought this app because I found it to be very useful. Last week however, it doesn't allow the alarm to ring, it just stays in deep-sleep until I push a button. Is there something I can do besides white-listing the alarm app I use ?? i use a tasker location profile wich toggles wifi. the profile didnt work well, so i disabled wifi management in battery saver. now tasker checks my location profile every time screen turns on. what happens when device is woke up after deep sleep, what all is triggered in that moment? is there a detailed description of deep sleep in android 4.2? Just testing Ds Battery Saver on my Samsung Galaxy S2. Is just what Im looking (and would be happy to buy the pre version of) for if it works well. However I just had the phone in ds mode (Balance mode). When I turned on the screen again, mobile data (3G/H+) was on, but my WiFi was off (and remained so), even though Im at home with WiFi available and the WiFi was on when the screen went off. Obviously this is not desirable. Using DE Pro on a Nexus 4. Everything works as expected and battery life drastically improved. 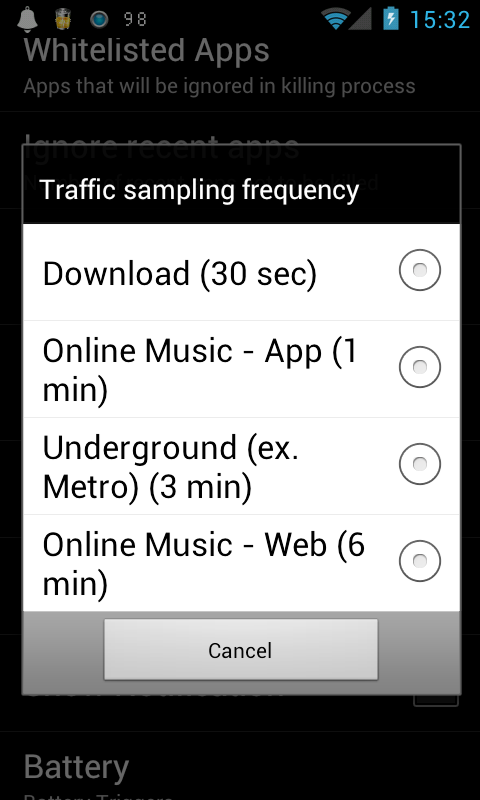 However I have some apps that will run sync in background at a set interval. For example Press (RSS reader) and Pocket Weather. The sync of these apps does not work anymore. Is there anything that can be done to trigger a sync when DS is waking up (5 mins every hour)?